A major pro-life rally in Belfast on Saturday heard from parents whose children had life-limiting disorders and who say that better support for families, not abortion, is the answer when children are diagnosed with severe disabilities in the womb. Three mothers of babies with life-limiting disorders gave powerful testimony at the annual All-Ireland Rally for Life, which began at Custom House Square in Belfast City Centre at 2pm. 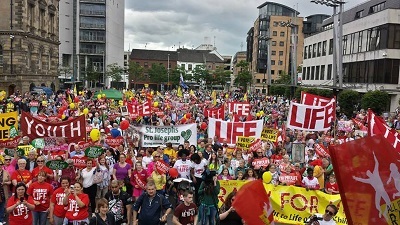 It was the largest pro-life rally yet held in Belfast as 8,000 people participated in the lively and colourful event that wound its way through Belfast before hearing speakers at the Rally stage. Smyth read a letter from the All Party Pro-Life Committee in Stormont, which supported the rally, and she said the huge rally was telling Ford that he should not attempt to bring in legislation that would allow for abortion in cases of foetal abnormality. Parents whose children had been diagnosed with terminal conditions told the rally of their individual experiences, and of the need to raise awareness about conditions such as Trisomy 13 and 18 and anencephaly. In moving and powerful testimonies they encouraged better provision of perinatal hospice care. “She was alive, I felt her move, and babies with Trisomy have lived for hours, days and weeks after birth. The length of that life does not make it less of a life,” said Bradley. “We’re seeking to support families who need compassion and real help, and both governments, north and south, must listen to parents in these situations who want a better answer than abortion,” said the Life Institute spokeswoman. Referring to the abortion legislation enacted in the Republic last year, she told the huge crowd that “it was an unjust law that had no moral authority,” warning that the bill would be overturned.